So I don't know how long this has been broken for, since I don't make use of old versions very often, but need to get this fixed. Can anyone suggest what might have gone wrong? What to look for? And how to fix it? It sounds to me like something's gone awry in your database at some point. Since the error is present in 3.6.5 then I'd assume its not related to 3.7. Go to Global Config and turn on Debug System & turn on Error Reporting to "Development" - any errors? Anything relevant in the error logs? 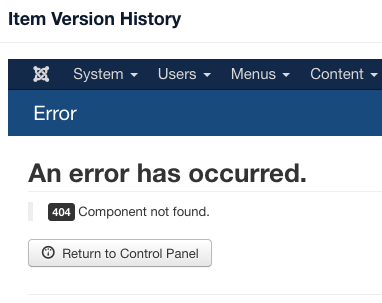 Please post any error messages you find that might help narrow down the issue. Are you only seeing this error in articles? What about under the Component menu? Not the answer you're looking for? Browse other questions tagged joomla-3.x component articles or ask your own question.